Last month I made a <48 hour trip up to Seoul to see my girlfriend who I hadn't seen in about 3 months (since moving to Singapore for work), but more importantly, the trip was to help her start moving some luggage over to Singapore. See, for inter-Asia flights you only get 20kg (~50lbs) of free checked luggage, but as I am a Gold member, I get 3 free bags at 32kg (70lbs) each, so I flew up to Seoul to bring 3 huge bags down to Singapore for her. I left Seoul at the beginning of June, just a week or so before the summer promo items started. Living in Seoul for the last 3 years, I only got the chance to have 2-3 promo burgers, and they introduced 2 right after I left, they were the Australia Burger, and the Europe Burger, as well as a promo dipping sauce for nuggets. I was hoping I would return in time to try them, but they finished the promo 5 days before I arrived....figures. 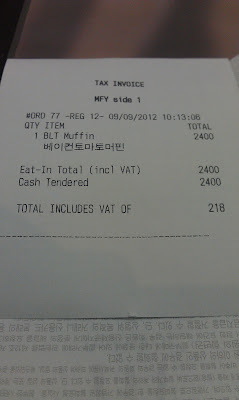 Luckily though, it wouldn't be a complete 'waste' of a trip for this blog, because just as they eliminated the summer promos, they introduced a possibly the most confusing menu item currently available in Korea, the BLT McMuffin! Now, I'm sure many of you are wondering why something as simple as the BLT McMuffin could be 'confusing', lets start with a little background. Korea isn't like the rest of Asia, the staff are not likely to speak English very well, and even if you are in a heavily touristed area like Myungdong, or Gangnam, and they do speak a decent amount of English, you are still likely to be misunderstood. Currently, all the McDonald's food names in Korean are the same as you should say them in English, with a little Koreanisation. For example, the Shanghai Spicy Chicken, is exactly how it is in Korean, the Shanghai Spicy Chicken, but as an English speaker, the Koreans taking your order might need you to repeat it a couple of times before they can understand, as they are used to Koreans pronouncing it. The Sausage McMuffin, slightly more Koreanised, becomes the 'Sausag-i Mc-mu-phin' when pronounced by Koreans. Now bucking the trend of matching names, the Korean name for the B.L.T. 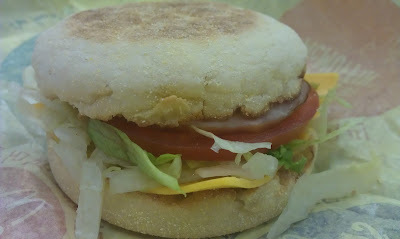 McMuffin is the English name for the 'Bacon Tomato Muffin'. 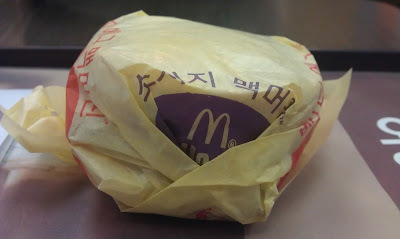 The rest of the breakfast sandwiches in both Korean and English are called 'McMuffins', I have no idea why they didn't keep the English name the same, but no doubt this will cause issues with non-Korean speakers. The second problem with this McMuffin is the bacon...there isn't any! 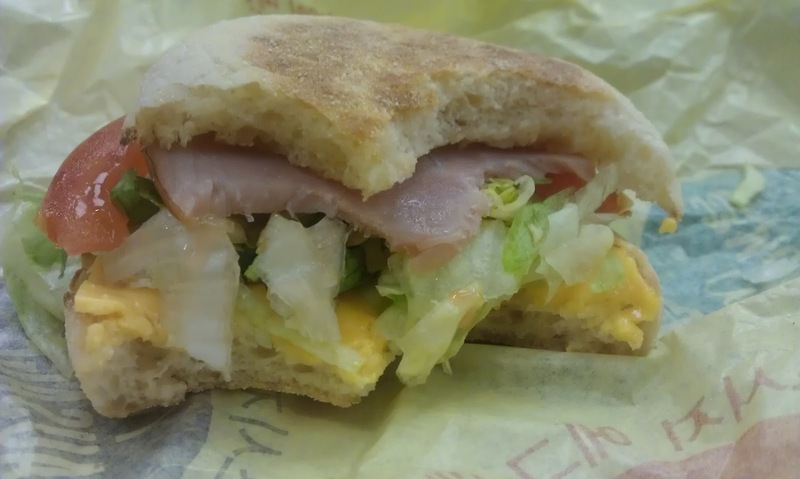 The BLT McMuffin contains the exact same ham slice that the Egg McMuffin has. To make matters even more confusing, McDonald's Korea HAS a Bacon and Egg McMuffin with a proper piece of bacon! So again, I have absolutely no idea why they named it as they did. Enough about the name, now I need to talk about the eating experience, because if it tasted great, it wouldn't matter about the poor naming convention. I was only in Korea for one morning, and I was going to my girlfriend house after lunch with some mates. 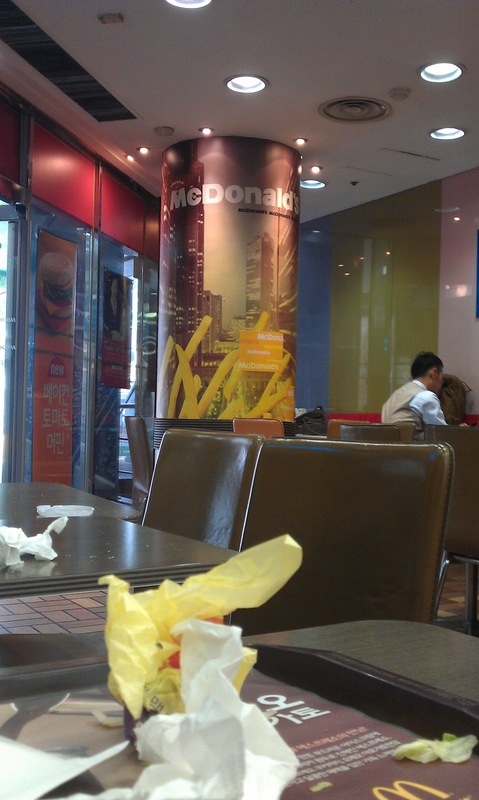 I had them meet me at the Gangnam branch of my the McDonald's at 10:30, as I was staying about a 15 minute walk away (and on a Sunday afternoon there would be more dining options in Gangnam, over the Seolleung Branch. I arrived at the branch at around 10:15, and strangely the girl in front of me was ordering 3 Ice Cream cones, and a hash brown (possibly a hangover cure?). I was the next in the queue, and I ordered in Korean, just to make it easier on myself...what I didn't expect was the nearly 11 minute wait I had to sit out until the sandwich was ready, I have no idea what could take so long, and it wasn't like the restaurant was busy, only one other customer came in after me (and he got his Sausage and Egg McMuffin almost instantly, so it wasn't waiting on the buns, it must have been the 'bacon' casuing the delays). The staff weren't apologetic, but I'm not sure if that was because I am white and he didn't want to try to speak English, but since I just ordered in Korean, and gave him my Korean McDonald's point card, he could have at least apologised for the wait in Korean. Sadly though, I knew even before I tasted it, it was a pretty pathetic new addition to the menu, not only is it just an Egg McMuffin, with the Egg substituted for lettuce and a small slice of tomato, it costs 200W MORE than the Egg McMuffin, which is just not acceptable. There is no way the small serving of veg costs more than an Egg. The sandwich tasted exactly like you would expect, a Muffin, with an almost non existent slice of tomato and ham, all I could taste was the lettuce and the cheese. I believe this now currently the ONLY unique breakfast item on McDonald's Korea's menu, and I can safely say you can give it a pass on your next trip through Korea.